The 3rd Annual HSL Properties Tucson Jazz Festival | Jan. 12th - 22nd, 2017 - TheUrbanMusicScene.com | Concerts & Festivals! 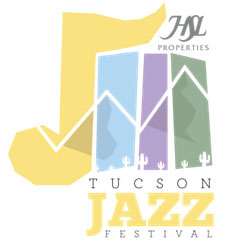 Tucson, AZ (December 2, 2016) —The HSL Properties Tucson Jazz Festival will present jazz of all genres in historic downtown Tucson Thursday, Jan. 12 until Sunday, Jan. 22, 2017. The lineup includes a dozen performances by local and national stars, including NEA Jazz Masters—guitarist and vocalist George Benson and vocalist Dee Dee Bridgewater. Tickets, ranging in price from $25 to $97, are available through links on the website www.tucsonjazzfestival.org. The first weekend features concerts presented by festival partners. UA Presents is kicking off it the festival and its jazz series with saxophonist Kamasi Washington on Thursday, Jan. 12. From a Tucson favorite, Pink Martini, comes vocalist Storm Large presented by Green Room Entertainment at the Fox and the Tucson Symphony Orchestra is bringing in guitarist and vocalist John Pizzarelli to perform with the orchestra at the Music Hall. The Festival is, primarily, a downtown event with concerts at the historic Fox and Rialto theatres. A free outdoor Downtown Jazz Fiesta sponsored by Rio Nuevo will be held on Martin Luther King Day, Jan. 17, with two stages: one featuring local and regional Latin jazz bands and the other featuring smaller jazz ensembles. Bands will also play indoors downtown all day and late into the evening. The day after the Downtown Jazz Fiesta, clarinetist Anat Cohen and guitarist Howard Alden will perform in a duo setting at Crowder Hall. Pianist Armen Donelian will grace the stage at the Scottish Rite Temple on Wednesday, Jan. 18 and George Benson will take the stage at the Fox on Jan. 19. DeeDee Bridgewater plays on Friday night with her quartet and the Tucson Jazz Institute Ellington Band with guest, drummer Lewis Nash, will open the show. Tower of Power will take over the Rialto Theatre on Saturday night and the final day has a Sunday Dixieland Brunch at the Hilton El Conquistador. The Tucson Jazz Festival is a great place to go during the winter – the average daytime high temperature during the 2016 festival was 67.1 degrees – the high temperature on the free 2016 MLK Day celebration was a sunny 72 degrees. The weather and world-class acts bring new winter visitors to town. The inaugural 2015 festival attracted 10,000 people over 13 days – 28% of whom were from outside of the Tucson area, fulfilling Mayor Jonathan Rothschild’s vision of a “destination” festival. This year’s festival brought 18,000 people to downtown and 35% of the attendees were from out of town. Thursday, Jan. 12—Kamasi Washington—Rialto Theatre, 7:30 p.m. , $15-$60, 318 E. Congress St.
Friday, Jan. 13—Storm Large “Stormy Love”— Fox Tucson Theatre, 7:30 p.m. $25-$74, 17 W. Congress St.
Friday, Jan. 13—Alex Weitz Album Release Concert — Club Congress, 10:00 p.m. , $35-$45, 11 E. Congress St.
Wednesday, Jan. 18—Armen Donelian—Scottish Rite Temple, 7:30 p.m. $35-$45, 160 S Scott Ave.
Armen Donelian, pianist/composer, has had an enviable 40-year career. Donelian apprenticed with a series of jazz giants starting in 1975 with Mongo Santamaria, where he presided over the piano chair once filled by Herbie Hancock and Chick Corea. Two years later, Sonny Rollins recruited him as a sideman for several tours. In the midst of his four-year tenure with Billy Harper’s band, he made his recording debut with 1981’s Stargazer, a trio date with Billy Hart and Eddie Gomez featuring his original compositions. Donelian has consistently explored his Armenian roots in his music and recorded for several labels with the Middle Eastern jazz ensemble Night Ark and he co-produced (with producer George Avakian) Listen to My Heart, a Sony collection of jazz interpretations of Armenian folk songs. Donelian has authored several authoritative texts, including Training the Ear and Whole Notes. This performance is sponsored by the Udall Law Firm. George Benson, guitarist and vocalist, always had the dual role of expert improviser and vibrant entertainer but few might have predicted that striking level of stardom 40 years ago when Benson was a fledgling guitarist working the corner pubs of his native Pittsburgh. Wes Montgomery, one of jazz’s most creative players, who came across Benson early on, urged him to continue his already impressive work. Benson had both the conviction and chops to nip at his hero’s heels; his 1964 debut was released as The New Boss Guitar. It lived up to its title. Benson’s tone was juicy, and his blues solos sparkled with a carefully honed logic. Hooking up with the CTI label in 1970, he was united with many of jazz’s finest instrumentalists. Classic albums, such as Beyond the Blue Horizon, abounded. But after a while different ideas began to flow from Benson’s muse. What happened was Breezin’, the first jazz record to attain platinum sales. The 1976 blockbuster, brought the instrumental title track to jazz radio. “This Masquerade,” which featured the guitarist scatting along with his solo break, was a pop smash. He followed up with many pop hits, including a sultry version of “On Broadway” and the irresistible “Give Me The Night.” The NEA Jazz Master has won ten GRAMMY®s, played around the world, and thrilled many crowds with his playing. Website: http://www.towerofpower.com/Sunday, Jan. 22—Dixieland Jazz Brunch with The Road Runners, 11 a.m. to 2 p.m.—Hilton El Conquistador, 10000 N. Oracle Road. Howe Gelb Solo, 8 p.m. Club Congress, 11 E. Congress St.